. . . have a YA Scavenger Hunt! Whee! Flickr user hmomoy calls this a “treasure map” but it appears to be a boring old regular map. Oh well. Ok, so maybe not all of my fellow librarians were annoyed but I think a few of them were. For my summer reading kickoff party this year, I created a scavenger hunt throughout the library and had the teens solve the clues. It took them all throughout the library and even outside. I made them visit the reference department, tech services, Children’s, YA, circ, the book drop, and periodicals. Our library also has basically a mini arboretum so I made them use a map of the all the trees to find a specific tree. Unfortunately, it started pouring right as they got to the outside clues! So they were a little soaked by the end. Why was everyone annoyed? Well, it’s hard to contain and constrain the excitement of the teens when you promise them mini-blueberry pies as a prize if they win. (These pies may or may not have been left over from the pie-eating contest over the weekend of the encampment. Ok, they were left over, but the kids still ate them.) There was a lot of that really fast walking you do when you know you’re not supposed to be running but it’s basically the speed of a slow jog so you do it anyway. I told the teens to slow down but I think this made of the other librarians nervous. I prepped the rest of the staff as much as I could, letting them know ahead of time that this was happening, making sure that they had the clues that day in case the teens asked for help. But I think they were just jealous at how much fun we were having! It was really fun and I think the teens had a good time, too. Because it was such a succes I’m even thinking of doing it next year and incorporating QR codes, pictures, and more clues! 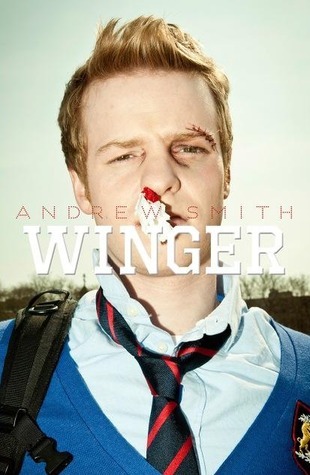 Before I go, a book note, you should go read Winger by Andrew Smith, it’s pretty amazing. The characterization of Ryan Dean, the titular ‘Winger’ is fantastic; I felt like I just spent a year with him. He’s quite the funny, caring, and yes, really horny, teenaged boy. He warmed my heart and made me cry. I highly recommend it. Finally, I think that I’m free to say this now, that I’ve been accepted into NELLS (New England Library Leadership Symposium) for this year with other librarians from around New England. This means I get to spend a week in North Andover, MA hanging out with some amazing librarians learning how to hone my leadership skills. I’m very excited! Do you have any fun summer programs happening or other summer things you’re excited about? Yay NELLS! I actually am having a scavenger hunt/get to know the library party on Friday (fingers crossed–we’re moving the library to a new building and it will only work if the stars align.) I am really excited about my Dinosaur Day and Shark Week activities this summer. Woohoo, NELLS! It’s going to be fun. I’ll see you there! Shark Weeks sounds great, too!